Helping parents and children interact lovingly and creatively in your space can be as simple as setting out paper and crayons. Print and copy this page and invite parents and children to sit together and share a few moments of relaxation. 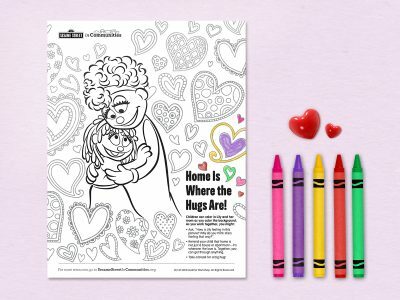 This coloring page can help adults communicate important ideas to children without saying a word: We can relax together. We can have a good time together. We can concentrate. I am here with you. I am listening. I am interested in you. We can share feelings. We can make something beautiful, even when the world around us feels ugly. If possible, parents and children should sit side by side in a quiet space with a surface. Children color the large Muppet image, adults color the more detailed background. There’s no right or wrong way to color; the goal is to sit and relax together. It’s okay to sit without talking, too! Parents can use the tips and conversation starters at the bottom on the page and, if possible, display their work. Children might also draw their own families on the back of the page. Creative self-expression can be a great way to show how you feel, using no words at all!